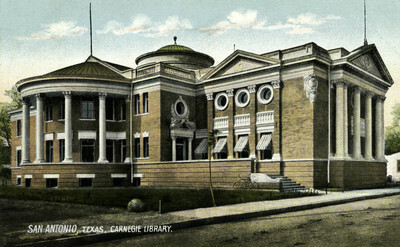 "Texas – San Antonio, Carnegie Library"
The Carnegie Library at San Antonio is one of the finest edifices in the city. Mr. Andrew Carnegie gave Doll. 50,000 for the building, and the site cost doll. 15,000. It has an endowment fund, the income of which , together with a special tax levied by the city, maintains its work. It is under the control of a Board of Trustees. We're stopping over Sunday at San Antonio - Expect to get home about Wednesday. Mama continues well. Have been going so constant by that a letter has been here an impossibility. M.G.M.